Naval photographers post your photos here. Warship tours, mistery ships, quizzes, etc. I think it is the ex-German cruiser Lützow, but as a Soviet cruiser. Same ship, named twice as a Russian possession, first sunk as Petropavlovsk then later raised and renamed Tallinn. Since it's firing from a pier, I wonder if it's a German CA in a last gasp defense somewhere. In looking more carefully, I agree the ship is Hipper. Lutzow/Petropavlovsk apparently did not have more than two operable guns, was only a small percentage completed, and may not have been protected with anti-torpedo nets. In looking at photographs of Hipper, their images match the mystery photo more closely. She was delivered to the Soviets with two functioning guns but progressed aft that. She had two turrets in service by the time of Barbarossa. I've seen this exact photo listed for sale at eBay, then with the caption "...heavy cruiser Prinz Eugen in Brest, 1942"
Not sure that the port shown is Brest - far more enclosed than in this picture? Terje Langoy wrote: I've seen this exact photo listed for sale at eBay, then with the caption "...heavy cruiser Prinz Eugen in Brest, 1942"
But, why would the Prinz Eugen open fire from a pier in Brest? I thought of that also. The elevation of the guns is very low, so extremely short range. Wherever she was, It might have been a practice shoot. Circumstances might have mitigated against going out to sea, but the guns needed to be fired periodically for crew training? If they were fired in anger, the enemy was VERY close. The crew would need training from time to time but the Bay of Biscay is hardly the place to carry out exercises if the RAF flies frequent patrols above their heads, not to mention the threat of British subs lurking in the very same waters. From June 1941 until February 1942, the Prinz Eugen was more or less stationary posted at Brest. As were the Twins. The crew would certainly need to refresh their skills after half a year of slumber in port before they would venture into the Channel, in a dash that would require the crew to perform at their best. Just to have mentioned it, there's also the anti-torpedo nets. I do suspect the need for such precautions at Gotenhafen, an enclosed harbour basin situated in Eastern Baltic waters, would be rather low. It would be pretty hard just to get in there, even for Günther. 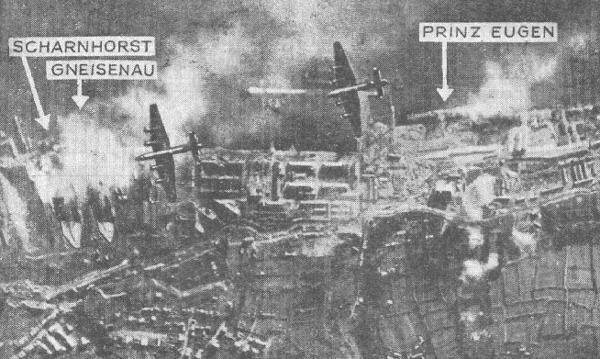 So, "...the Prinz Eugen seen in Brest sometime before Cerberus" is a pretty good call by me. 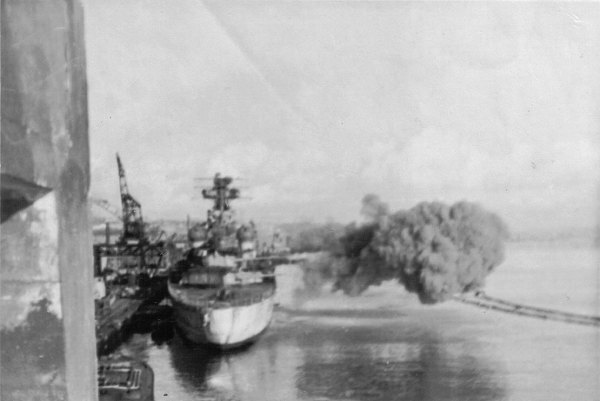 Air raid on Brest in December 1941. Didn't Prince Eugen have 20mm AAA added on top of the C turret before Cerebus? I'm not sure about this, but apparently it's not there, which would date the photo to sometime before 1942.